This simple Curry Chicken is a common delicacy in South Asia (specifically India), East Asia, as well as in the UK and Caribbean. A typical spicy Curry Chicken is easy to make, consists of chicken in an onion, tomato, and yogurt-based sauce, flavoured with ginger, garlic, chillies and a variety of spices, often including cumin, cinnamon, cardamom. 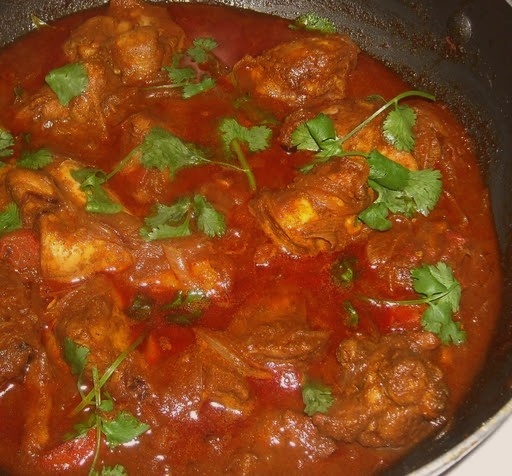 Chicken curry is sometimes made with pre-made curry powder. Milk is sometimes added to decrease the spiciness. Heat oil in large pan, saute onion, ginger and garlic, stirring until onion is soft. Add chicken, cook, stirring, until browned lightly. Stir in spices, lemon grass, lime leaves and chilli, cook, stirring until fragrant. Add remaining ingredients, simmer, Bring to a boil, reduce heat, and simmer for 20 to 25 minutes. Serve Curry Chicken with rice, prata or naan bread.